Accept customer payments online using our integrated payment gateway. According to the latest surveys, 72 percent of car buyers would prefer to complete the credit application and financing paperwork online. Give your customers what they really want with our Online Payment Collection Form for car dealers. 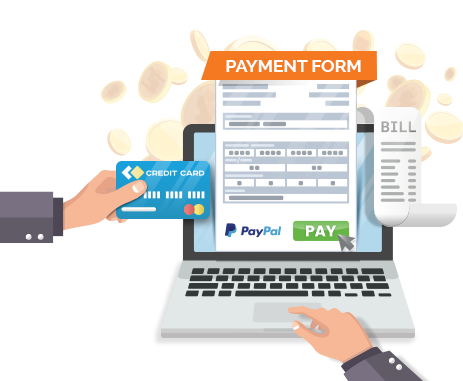 This form is a comprehensive system which allows you to securely collect payments online, and automate your administrative routine, saving you from any redundant paperwork. The payment form is embedded into the webpage using the data-theft protection specifically developed by Autoxloo. It adds an extra layer of security and protects data from any malicious third-party scripts. The customers’ sensitive information is safeguarded, because it is transmitted over an encrypted channel to the payments system (PayPal*). The integration between the dealer website and PayPal is smooth and seamless, so the customer won’t notice the redirection to PayPal. In the customer’s eyes the entire checkout process will occur on your website. *To use the service you have to have an active PayPal Payments Pro account. Offer your customers the convenience of in-house financing, and save your time by providing online BHPH payments. Customize fees to cover the PayPal withdrawal charges. Add more structure to your BHPH dealership. Increase your dealership cash flow and customer loyalty with Autoxloo’s Online Payment Collection Tools.